A pre-receive environment for GitHub Enterprise is a Linux chroot environment. Because pre-receive hooks execute on every push event, they should be fast and lightweight. The environment needed for such checks will typically be minimal. GitHub Enterprise provides a default environment which includes these packages: awk, bash, coreutils, curl, find, gnupg, grep, sed. If you have a specific requirement that isn't met by this environment, such as support for a particular language, you can create and upload your own 64-bit Linux chroot environment. docker build -f Dockerfile.alpine-3.3 -t pre-receive.alpine-3.3 . 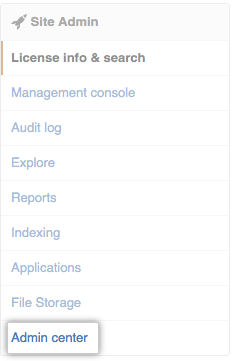 This file alpine-3.3.tar.gz is ready to be uploaded to the GitHub Enterprise appliance. 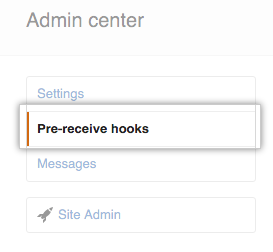 In the left sidebar, click Pre-receive hooks. Upload a readable *.tar.gz file that contains your environment to a web host and copy the URL or transfer the file to the GitHub Enterprise appliance via scp. When using scp, you may need to adjust the *.tar.gz file permissions so that the file is world readable. Pre-receive hook environment 'AlpineTestEnv' (2) has been created.